Interested in attending a STEM-based summer camp? View opportunities. Laveen schools elect 13 students to participate in a state-wide STEM program. Chief Science Officers serve as STEM ambassadors and promote STEM programs. The purpose of the institute was to help CSOs learn how to advocate for STEM on their own campus. What is a Chief Science officer? Identify STEM Resources in the Laveen Community by visiting our STEM Pathways page. Three Chief Science Officers from the Laveen School District were invited to participate in a panel discussion. The invitation came from the East Valley STEM Alliance. STEM industry professionals from the East Valley STEM Alliance invited our Chief Science Officers to learn the following: 1) how we are currently promoting STEM, 2) how STEM professionals can partner with our district and 3) what road blocks exist. The panel discussion will take place at Intel and State Farm. Chief Science Officers had the opportunity to meet with our partners from Viasat before their Cabinet meeting. Omar Alam (Engineer) and Alex Gundersen (Engineer) had the opportunity to meet with Laveen’s Chief Science Officers and discuss the following topics: motivation to becoming an engineer, challenges when they were in school, advice on how to prepare to become an engineer, and what it is like being an engineer. 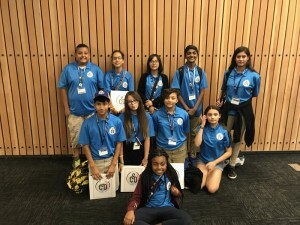 During the conversation several Chief Science Officers stated that they had a better idea of what an engineer does and what they need to do in order to prepare to become an engineer. Both Mr. Alam and Mr. Gundersen plan on partnering with out students at their school. As part of their responsibility to promote STEM on their campus, CSO Araceli and CSO Charles are co-teaching science to their 5th grade peers. Both CSOs enjoy teaching their peers because they can share their passion for science. I attached two photos. On December 19, the Chief Science Officers hosted their first SciTech event. During the event students and parents had the opportunity to learn about STEM resources from Laveen School District Schools, Fairfax High School, Chavez High School, Arizona State University, Grand Canyon University, University of Advancing Technology, non-profits, government agencies, and STEM industry. There were two outcomes for the event. First and foremost, the Chief Science Officers wanted to give families an opportunity to identify STEM resources in the Laveen community from kindergarten to career. The second outcome was to create a webpage that would identify STEM resources within our community. View the STEM Pathways website. Laveen CSO’s attended their first cabinet meeting at Estrella Mountain Community College. During the cabinet meeting CSOs received leadership training, worked on their action steps, and learned about hands-on STEM resources from the Sci-Tech Council. CSO Charles, CSO Reyna, and CSO Nikhil helped to promote the CSO program during a Laveen Education Foundation Business Breakfast. CSO Charles, and CSO Nikhil gave brief speeches explaining the CSO program and inviting participants to participate in an upcoming CSO event. All three CSOs led table discussions.